The Praxis Core Skills tests measure competency in three areas: reading, writing and math. Colleges and Universities may use them to evaluate candidates for entrance into teacher education programs. Many states require the Praxis Core Academic Skills for Educators and Praxis Subject Assessment for teacher licensure. Though these tests measure basic competency, they are rigorous. Be prepared to pass them the first time by knowing what is on each exam and selecting the best preparation materials for these specific tests. 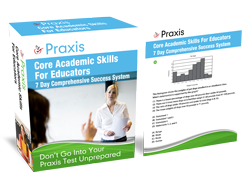 Get the best Praxis Core Practice Test and study guides you can. The cost of failure and delaying your progress in education is always higher. If you believe that a teacher can make a difference in students’ lives, you are not alone. This makes sense. But how can schools ensure they are hiring “quality” teachers? One way is to test teachers’ knowledge, skills and abilities before they enter the classroom. The Praxis Core test attempts to do just that. Their creator, The Educational Testing Service (ETS), was founded in 1947. Its mission is to “advance quality and equity in education by providing fair and valid assessments…” (https://www.ets.org/about/fast_facts). Although tests do not guarantee success in the classroom, the purpose of the Praxis Core Academic Skills for Educators is to do just that: attempt to measure knowledge, skills and abilities of those entering the teaching profession. What do these three have in common? An effort to show accountability. Schools that need state and federal funding must follow state and federal laws and policies. Each state has its own department of education to oversee licensure. State departments of education answer to the U.S. department of education, a cabinet-level department created by President Jimmy Carter in 1979. The national secretary of education advises legislators and ensures their legislation is enacted. each Praxis Core exam is reviewed regularly to revise based on standards, state licensure and current relevant job analyses. What Can I Expect on the Praxis Core Exams? You may choose to take all three segments of the Praxis Core Academic Skills for Educators at one time or separately. Fees are $90 per test if taken separately or $150 if all are taken at one time (5 hours total are allotted if all three are taken at one time). Because these Praxis exams are rigorous, use preparation materials designed specifically for these tests. For more detailed information about the types of Praxis Core questions and the entire standards/skills tested, see https://www.ets.org/s/praxis/pdf/5712.pdf. For more detailed information about the types of Praxis Core exam questions and the entire standards/skills tested, see https://www.ets.org/s/praxis/pdf/5722.pdf. For more detailed information about the types of Praxis Core test questions and the entire standards/skills tested, see https://www.ets.org/s/praxis/pdf/5732.pdf. There are many ETS test centers around the globe. You may register for a Praxis Core exam by registering online at https://www.ets.org/praxis/register or by mail (page 20 of the bulletin found at https://www.ets.org/praxis/about/bulletin). Payment must be made at the time you register. The cost of each test is $90. If you take all three, the cost is $150. Because of the cost, candidates will want to ensure a passing score the first time. To do this, use up-to-date test preparation materials to gain confidence and a passing score. the test must be required by an authorized score recipient. Find more information at https://www.ets.org/praxis/about/fees/fee_waivers/. You must apply by the appropriate deadline on the form. When you register, you must pay your fees with a credit/debit card, eCheck, or PayPal. Once you register, print your admission ticket from your online account to ensure there are no errors. Currently, the admission ticket is not required, but some centers may ask for it. All Praxis Core testing is done on computer. An online calculator is provided for the mathematics test. Test-takers with disabilities who need accommodations must submit a request to the ETS Disability services at www.ets.org/praxis/register/disabilities. Depending upon your needs, the review and accommodations may take up to 12 weeks. Save Time, Money and Frustration: Pass the Praxis Core the First Time! The latest data on Praxis Core shows that over 80% of test-takers pass the test each year. Good news. But look deeper on blog posts and you will find that a number of candidates retake at least one portion of the test 3, 4, or even 5 times. How can that be? Take a real-life example. Claire (not her real name) always wanted to teach kindergarten. Yet to do so, she must pass the math portion of the Praxis Core Academic Skills for Educators which includes geometry and algebra. The last time Claire took geometry and algebra was 6 years ago, and she hasn’t had a use for them since. Now Claire is hoping that the tutor she hired will help her pass on her third try. Three tries means an extra $180 plus the amount for the tutor. What could she have done differently? More importantly, what can YOU do to pass the first time? Read the Praxis Core “study companion” for the exam, found at https://www.ets.org/praxis/prepare/materials . Each test lists specific standards it is testing. Be honest with yourself: which areas are your weakest? Print out a copy of the pages and highlight those areas that you need to work on. Look for help. Research shows that the best Praxis Core study and practice materials can not only improve your score, but they can also improve your confidence going into the exam. How Can I Find the Best Praxis Core Study Materials? Reread the first two items above: if you know what is being tested and you know your weak areas, you are half-way to success! Check the questions against the sample questions offered. Is the format the same? If questions are too easy or too difficult, you will not get the results you want! Check the explanations to see why each correct answer is the correct answer. Check the explanations to see whether each incorrect answer is explained! If you can see why your answers are correct OR incorrect, you may spot patterns of words or phrases that “trick” you into answering the question incorrectly! Hiring a tutor can be attractive to you if you are never motivated to study. But keep your eye on the goal: pass the test the first time AND save money! When you find the adequate Praxis Core practice materials, study the right way, using research to guide you. Use many short Praxis Core practice sessions and take some time between Don’t cram for days. Doing this allows your long-term memory to store information. Taking one full-length Praxis Core practice test worked better than taking two or more full-length tests if the tests were taken in a short time frame. Again, extend the time between practice tests. One full-length Praxis Core practice exam taken between 1 and 6 days before the final test had the most impact. So save one of the tests for this time period. Make sure you have more than one practice test available. ask yourself, “What don’t I understand?” and be honest. Find a resource who can help you uncover the reason you have difficulty with this question or standard—and it doesn’t have to be a paid tutor! Avoid having to stress over retaking any part of the Praxis Core test. Invest the extra time now so you won’t have to kick yourself later. Making major progress toward a career in education is all downhill after you bridge this obstacle! Go to: 7 Dirty Truths About Praxis Core Study Guides And Practice Tests That’ll Make Your Stomach Sick.